Listed below are Team Fortress 2 weapons obtainable either only by crafting or by buying a game. These weapons do not drop like normal items. 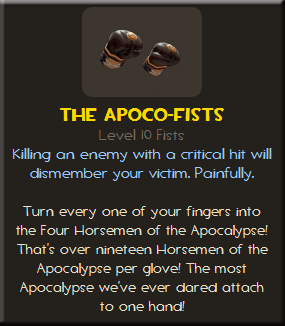 These are a pair of gloves worn by the heavy. This weapon is identical to the default fists, but cause an enemy to explode when they are killed. In other words, killing an enemy with these fists is identical to killing them with an explosive weapon, such as the rocket launcher or the stickybomb launcher. 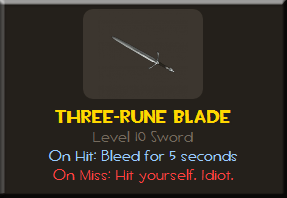 This weapon is a promotional item that was given in genuine quality to players who pre-ordered Saint Rows: The Third on Steam before November 15, 2011. This is a melee weapon used by the scout. It is simply a re-skin of the Boston Basher and has no unique attributes of its own, though, the sound it makes when it hits an enemy is identical to the Eyelander. This weapon is a promotional item for the game, The Witcher 2, and was awarded in genuine quality to players who preordered the game on Steam before May 17, 2011. This is a melee weapon used by the spy. 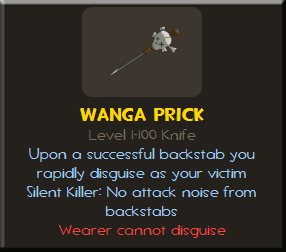 It is simply a re-skin of the default spy knife and has no unique attributes of its own, however, it is not possible to taunt kill with this weapon it does not utilize the fencing taunt. This weapon is a promotional item for the game, Assassin's Creed: Revelations, and was awarded, along with Dashin' Hashshashin, in genuine quality to players who preordered the game on Steam before November 29, 2011 in the United States and December 1, 2011 for other countries. This is a melee weapon used by the pyro. It is simply a re-skin of the Homewrecker and has no unique attributes of its own. This weapon is a promotional item for the game, Red Faction: Armageddon, and was awarded in genuine quality to players who preordered the game on Steam before June 6, 2011. 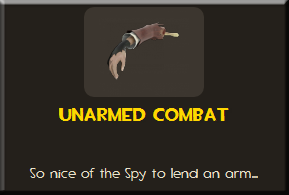 This is a melee weapon used by the spy. 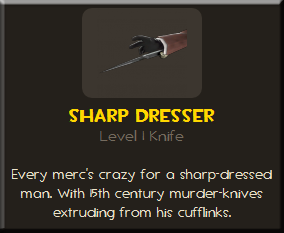 It is simply a re-skin of the Saharan set knife, Your-Eternal Reward, and has no unique attributes of its own, however, it does not constitute as part of the Saharan spy set. In other words, if you want the reduced decloak sound volume from the set then you must equip Your Eternal Reward as the melee weapon along with the L'Etranger and the Familiar Fez. This is a melee weapon used by the scout. 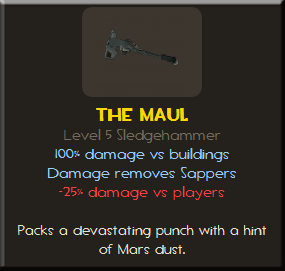 It is simply a re-skin of the Special Delivery melee weapon, the Holy Mackerel, and has no unique attributes of its own, however, it does not constitute as part of the Special Delivery set. In other words, if you want the increased health from the set then you must equip the Holy Mackerel as the melee weapon along with the Shortstop, Mad Milk and the Milkman. Also, this weapon displays the phrase 'ARM KILL!' instead of 'FISH KILL!' when an enemy is killed by it. what about the big kill (Spy)?